Female Hair loss is one of the hardest issues to deal with for any woman. Women are identified by their hair and hairstyles and society considers it an important feminine quality to have beautiful healthy hair. Unfortunately, by age 60, almost 40% of women will experience hair loss. At Hair Restoration Savannah, our team can restore your hair permanently. We can do so with a variety of combination treatments and permanent hair restoration. When women are experiencing hair loss an elevated level of testosterone/DHT may be responsible. A blood hormonal profile can help diagnose a hormonal imbalance. Treating hair loss caused by hormonal imbalance with Rogaine 2% (or 5% if post-menopausal and if 2% doesn’t work) and/or finasteride (Proscar* or Propecia). This is an over-the-counter supplement for prostate hypertrophy, such as Saw Palmetto, may also be effective. Bioidentical Hormone Replacement Therapy can have a positive impact on hair regrowth in some cases and is a great solution for men and women for overall health and as a natural anti-aging method. Hyperthyroidism, a deficiency or excess in thyroid hormones, can cause hair loss. Additional blood profiles can determine if Hyperthyroidism is the cause. A common cause for female hair loss, especially in ethnic women, is chemical burns from relaxers and harsh hair products that are used to straighten the hair. Other contributing factors are often constant pulling of tight braids, weaves, and tight ponytails this is called traction alopecia and is common in all ethnicities. The hair loss caused by traction alopecia is often evident in the hairline and near the ear wear the constant pulling takes place, however with the weave craze over the last decade, we are also seeing random spots of baldness caused by tape-in weaves and sew in weaves. 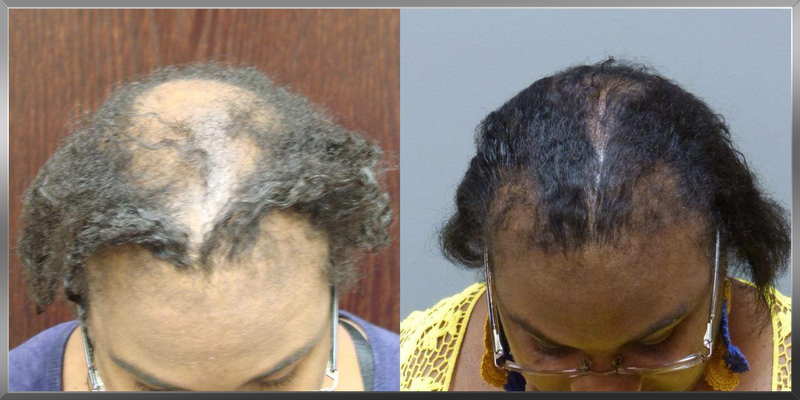 Assuming hormonal imbalance is ruled out as a cause, Dr. Finger often recommends hair medications, supplements, and PRP to restore the hair along with a permanent transplant option. The strip method also called FUT method can be ideal for women because there is no visible scar if you don’t wear an extremely short hairstyle and with the strip method the initial graft amount that can be retrieved is often higher than with Neograft. Read more about FUT versus FUE here. If you are considering hair transplant surgery, our hair restoration center recommends NeoGraft; a scarless, painless, permanent, natural-looking hair replacement technique. With this method which is called Unit Extraction (FUE), hair grafts are taken from the back of the scalp and placed into the desired, thinning area. Results are completely natural-looking. One requirement for NeoGraft is the availability of donor hair at the back of the head.